Sandhill Cranes have distinctive calls you recognize immediately, once you know them. They rattle, and croak and reverberate through the estuary. The first time you hear that sound, you’ll expect something magnificent, prehistoric, indefinable. And that’s precisely what you’ll encounter. Cranes have ancestry reaching into the Miocene Epoch, 24 to 5 million years ago. They are visions of that geological timeline … of their past in the murky marshes, when oceans receded, the mountains grew and the grasslands seeded themselves across the continents. The cranes pictured here and in the video below are resident birds at the beautiful George C. Reifel Migratory Bird Sanctuary in British Columbia. This family has, as you can see in the movie clip, little fear of humans, owing to the year-round presence of birders, photographers and families on the trails encircling their 850 acres. I believe the sounds I filmed here are “guard calls” — warning vocalizations. We’d been on the trail in relative quiet, in the company of habituated ducks and these cranes. A sudden cacophony and panic flight in the duck community set off a chain reaction of alarm, as the cranes turned their eyes to scan the skies. I’m assuming it was an eagle warning although I can’t say with certainty. The area was swarming with adult and juvenile Bald Eagles who regularly patrol the marshes like white-headed drones. 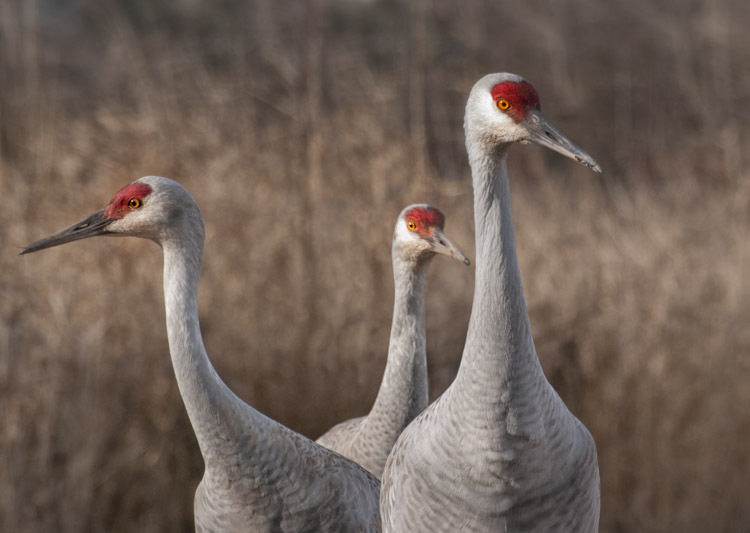 Among Sandhill Crane subspecies, there are Lesser and Greater — with Lesser approximately three feet in height, and Greater reaching five feet. Other subspecies including the Mississippi and Cuban Sandhill Cranes are critically endangered. These magnificent birds are a sight to be appreciated in our day, their populations nearly wiped out by hunting and development earlier in the century. Over-hunting and development are still critical concerns for crane survival, according to the International Crane Foundation. A recent 10,000 Birds blog post led me to an article in Physorg.com which further breaks down the genetic diversity of these birds, and discusses how human threats could be a significant factor in depleting these important sub-populations. Forgive the choppy editing. Did it on the fly. I shot this with my Panasonic ZS10 point-and-shoot, which has a 16x zoom in its tiny body. The call of Sandhills Cranes is instantly recognizable to my ears and it is a sound I miss deeply during the winters here in Utah. It won’t be long before they return and enchant me as they do every year. I’m so very glad they were brought back from the brink of extinction. Love the photos, especially the one of the bird looking skyward. The first time I ever heard it was during a fly-over. I was mesmerized, brought to tears. It happened on the same morning I watched a huge flock of Tundra Swans fly across the sunrise in the Sacramento Delta. Let’s just say I was having a good day. I might have to take a spring trip to your area just to see them there. Heber Valley is the area I’ve heard about. Is that a good viewing spot or would I be adding to the overrun if I went? Ingrid, the calls of the Sandhills make me react much like hearing a Coyote howling, it touches deep into my spirit. They also bring tears to my eyes. It is nature uncensored. I’ve heard the viewing is great in Heber Valley for Sandhills and I doubt that you would be adding to the overrun at all. If you do come this way let me know ahead of time, it would be awesome to meet you. I will let you know for sure. Thank you, Mia. It would be fantastic to make your acquaintance! The same holds true if you come up to the Northwest … and then, to the Bay Area, once we move back. I admit to ambitions that sometimes over-reach my capacity to carry them out. But, Hugh and I have done several trips to Utah (usually piggy-backing on a Best Friends visit in Kanab), and I cannot get enough of the loveliness. I’ll never forget the first time we hiked Canyonlands. Awe is not a big enough word. I’ve been working my way through your location posts, and am itching to get to some of the spots you call favorites. I only get to see these birds in zoos down here in Arkansas. Great captures Ingrid. 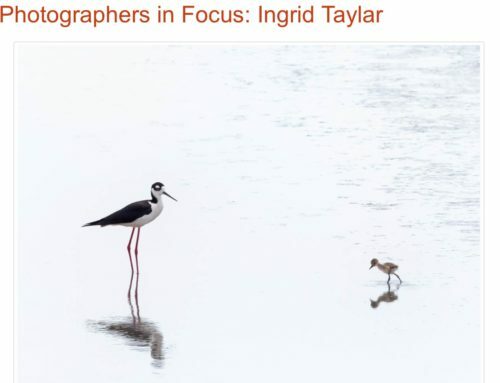 Ingrid you have truly captured the essence of the Sandhill Crane here. The call of the Sandhill Crane is my favorite of all bird species because, as you and Mia have so described, it is a prehistoric and ancient voice that fills the sky and your heart all at once. Luckily for me, where I live in Northern California, the Sandhill Cranes fly directly over my house in the spring as they return to their breeding grounds to the North. Whenever I hear them, I stop whatever I am doing and listen, hoping to catch a glimpse of the flock flying overhead. These gorgeous birds winter in the Sacramento Valley where they are often seen in the fields around the Cosumnes River Preserve. There is also a Sandhill Crane Festival in Lodi, California every year. Thank goodness they don’t hunt these beauties in California since they only lay two eggs per year and are lucky to raise one offspring to maturity, plus they don’t breed until they are at least two years old. I can only dream of one day getting photos of the Sandhill Crane as beautiful as these. The family portrait is wonderful but the shot of the juvenile looking up in the Eagle Alert is magnificent! I really enjoyed the video too. Larry, I would so love to see them in the numbers my friends have, over the Delta area. We’ve been to Cosumnes, and saw them in small family groups. And we saw one flyover. But I’ve never been at the huge evening return, at the edges of the fields where they settle in for the night. What is it like at your house? Do you see them in those huge numbers as they pass northward? I swear I’d have to kiss the ground (or sky) in appreciation over that sight. Ingrid, more nice work! Magical birds! I agree with the others here, the sounds of calling flocks of Sandhills always makes me run outside to see if they are landing or just doing a flyover. Here on the coast we have them seasonally in our fields and often have flocks up to a couple of hundred. Their calls are very distinct and seem much closer when you sometimes see them only as little specks in formation. Trumpeter Swans, so perfectly named also have mysterious calls. At night I can hear then in the fields when they are here and they sound like a distant dinosaur communicating in small burst. When they are flying and really bugling with their massive white forms cutting the air, one can’t help but be impressed by one of the most graceful creatures in nature, much like the Sandhill Crane!